Salvatore Profeta first appears in the Painesville, Ohio, area about 1905. Salvatore migrated to Painesville from Pennsylvania about 1905. 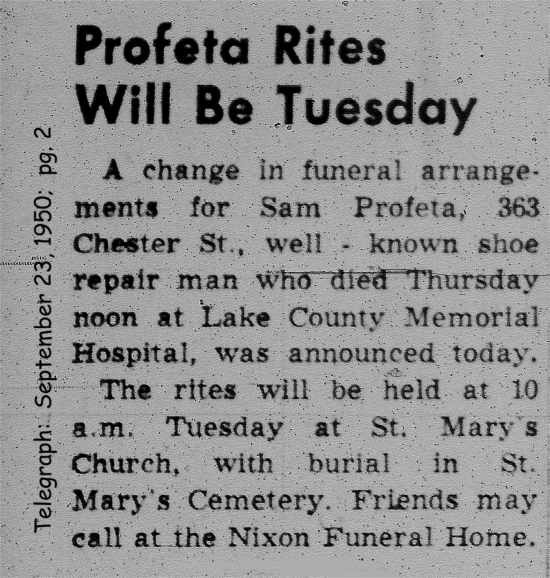 In America, Salvatore Profeta was known as Sam Profeta. Salvatore Profeta, son of Angelo Profeta and Giuseppa Seggio, was born on November 20, 1878, at Villarosa, Sicily. He married Rosa Barbera, daughter of Salvatore Barbera and Maria Seggio, on October 12, 1902 at Italy. Salvatore died on September 21, 1950, at Lake County Memorial Hospital, Painesville, Lake County, Ohio, at age 71, of a coronary thrombosis. His body was interred at St. Mary Cemetery at Painesville Township, Lake County, Ohio. At the time of his death, Salvatore resided at 363 Chester Street, Painesville, Lake County, Ohio. 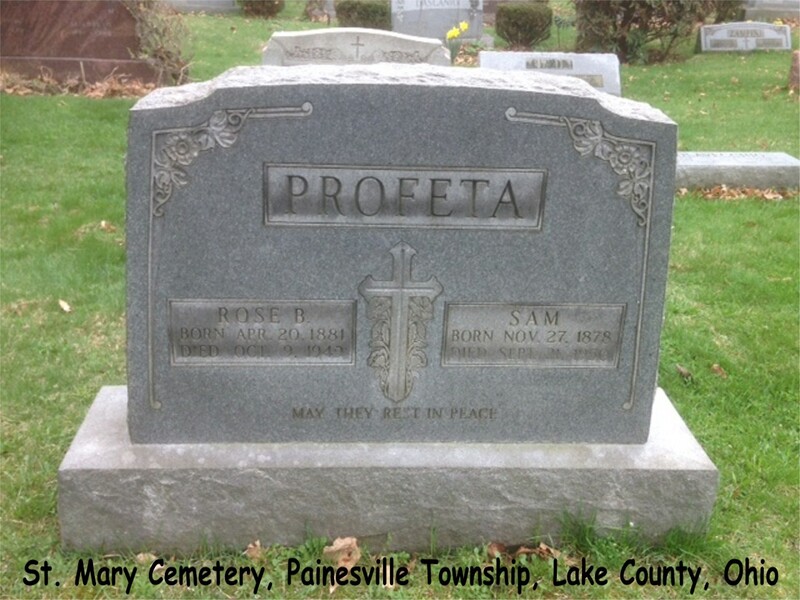 Salvatore Profeta, age 24, first immigrated to the United States on November 4, 1903, travelling to Dunbar, Pennsylvania, joining his brother-in-law. Salvatore made two additional trips (in 1905 and 1907) from Italy to the United States. 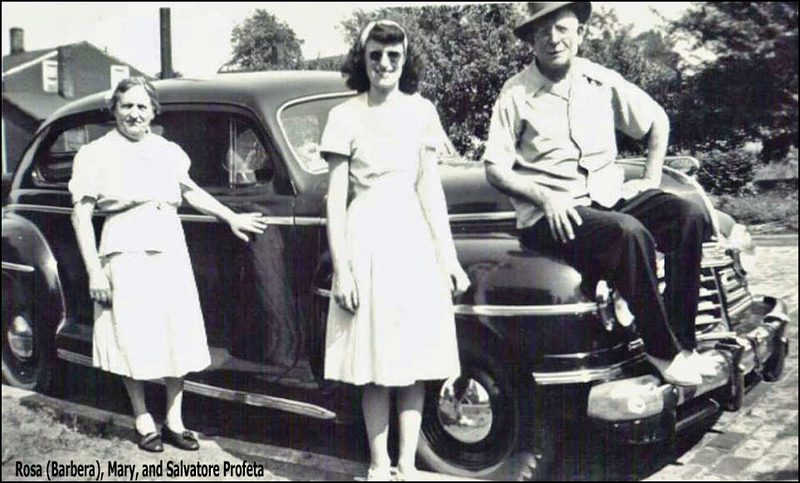 In 1909, Salvatore’s wife and daughter joined him in Painesville. 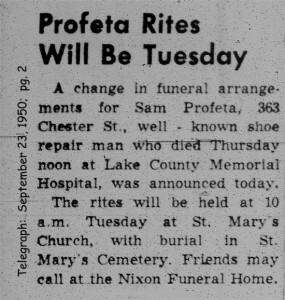 Salvatore Profeta became a citizen of the United States on September 26, 1921. Salvatore resided at 539 St. Clair Street, Painesville, Lake County, Ohio, when he was naturalized. Salvatore had two brothers living in Painesville. His brother, Antonio Profeta, come to Painesville in 1909; and brother, Angelo Profeta, in 1910. Salvatore owned and operated a shoe repair shop on North State Street in Painesville from 1908 until he retired in 1948. His shop made him popular around town. He was a witness in the Citizenship process for at least six other Painesville Italians.